The Hetchins Register is a list of Hetchins known to exist. It is based on voluntary reports by owners and other enthusiasts. 2,200 frames were registered as of April 2016, or roughly 16% of the total production. The registration of frames is voluntary and free of charge. It serves several purposes, including research into the history of the marque, identification and dating of frames (not only the one actually registered, but many more already registered and many more yet to be registered), and tracking lost or stolen frames. It also helps to prevent fraud by uncovering forged frames and deterring further forgeries. See Magnum Bogus. It can also help to uncover and deter bogus offers of genuine frames (e.g., offers of frames by people who do not own them). The information is held in confidence and personal details will not be published, though anonymous statistics pertaining to numbers of surviving models may be published for research purposes. How the Hetchins Register came to be. In about 1989, it occurred to someone to start keeping track of Hetchins bikes or frames known to have survived, and so a list was begun by Hilary Stone. About 1994 or '5, Len Ingram took over the maintenance of the list, henceforth called the "Hetchins Register." 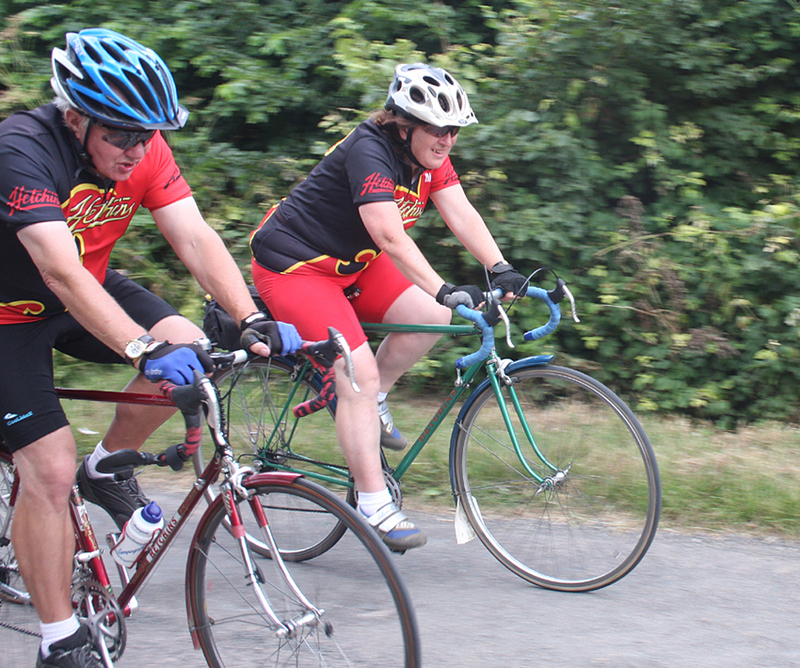 At first, entries were mostly by word of mouth or chance opportunities offered by vintage cycling events. The advent of the Internet changed that radically in two ways. 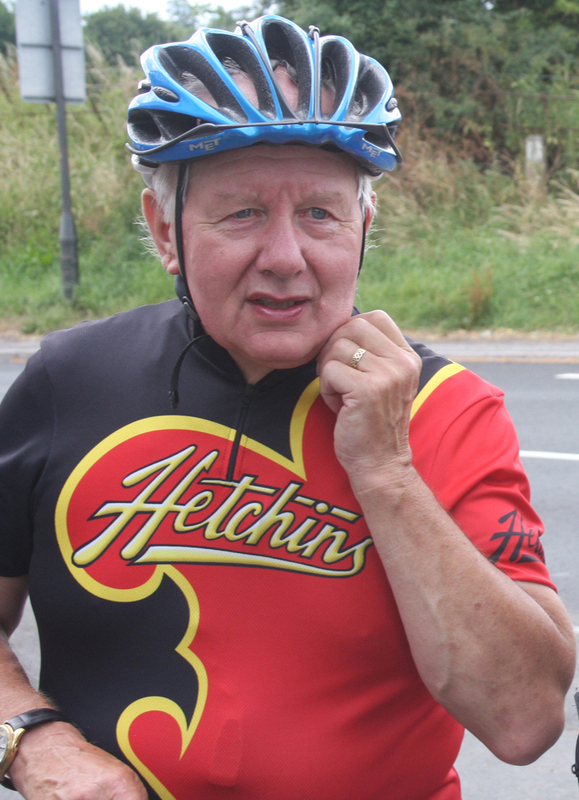 First, Hetchins came to be advertized at online auctions, such as ebay; this greatly raised awareness of Hetchins generally, and also brought to light a good number of previously unregistered bikes and frames, often with serial numbers given at the auctions. Second, the advent of this web site in the summer of 2001 further contributed to awareness of Hetchins generally, as well as encouraging readers to entrust us (Len and myself) with information pertaining to extant bikes and frames. It is no exaggeration to say that, due to Hetchin's Internet presence, interest in the marque and information about the marque has increased a hundred-fold in the last 15 years. For roughly 15 years from the summer of 2001 when this web site came online, the 'organigram' looked like this: I, the Editor, ran and updated the web site (the code monkey, if you will); Len held the documentary evidence which formed the basis for information pertaining to quantities of models produced and extant, which information was subsequently (in drips and drabs, not systematically) published at the web site. The documentary evidence consists primarily of two sorts: copies of the original shop sales ledgers (retrieved from Alf as the Southend shop was closing down), and the Hetchins Register, started by Hilary Stone and carried forward by Len. The sales ledgers list original production (including dates and serial numbers, usually but not always the model, sometimes the original owner or sales agent, rarely some special information such as 'on loan' to a racing team or 'show bike'). The Hetchins Register lists the frames we know to have survived. Information about hitherto unregistered frames arrived at Len's desk via post, telephone, or email. He nearly always followed up an initial inquiry by phone or email to verify details. He would then check the details against the sales ledgers, to verify serial number, model, date of sale, and so on. Thereafter, he would update the Register. And so the Register grew from a few hundred entries, as he had inherited it from Hilary Stone, to the final state in which he left it with 2200 entries. What the Register does not show is when a frame is lost, e.g., thrown away during house clearance, rusted away in a shed, melted down in a garage fire, etc. ; disappearances are not reported to us. In the Spring of 2016, it became evident that Len's health was failing. Len and I agreed that the Register should continue and that I would be a suitable candidate to take it over. In March of 2016, I stayed with Len and Jean Ingram at their house for four days and Len initiated me into his system of noting down details and verifying them and then updating the Register. He had had several inquiries in the months and weeks prior to my visit, and so he walked me through the process. Over the course of four days, we produced the final version of the Register for which he was personally and directly responsible. Len had already digitized the sales ledgers (as Excel files). With Len's consent, custodianship of the Register and the digitized copies of the documents were transferred to me. Len died four weeks later. The work Len put into it was simply monumental and it stands as a benchmark for collectors of vintage items of any sort whatever. It is an invaluable resource for investigating the history of the marque and for positioning individual frames within that history. There is long gap in the sales ledgers, from 1967 to 1986, and the Register is the only the resource available to try to fill in that gap. Occasionally a frame turns up from that gap period for which the current owner has solid documentation, and suddenly we have an anchor point which allows us to date that frame's serial number, and from there literally dozens of other frame numbers already on the Register (and subsequently to be added) fall into place. See this page for a sample of original owner documentation. I should like to thank a great many people, who must remain unnamed here but you know who you are, for their continued help and support in the maintenance of this web site. Nonetheless, I cannot neglect to mention Len Ingram as one of the most helpful, and consistently diligent and patient, researchers into the history of the marque; his efforts have contributed significantly to our knowledge of the various models, their dates of production, their distinguishing characteristics, and, in the form of the Register which he so meticulously maintained for many years, their survival rates. It is a fitting legacy for such a dedicated enthusiast.